HED International has installed a new PRO-CAST® Model TCM-121 Tapecasting Machine and Pilot Plant at their New Jersey Technical Service Center. This facility will extend HED’s tapecast product development and customer service capability. 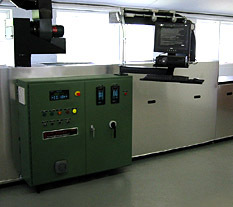 The pilot plant can produce a precision tape cast film as thin as 10 microns continuously on either a stainless steel conveyor or polymer carrier. Contract tapecasting and product development service is also available.